This just goes to show that not ALL the great ideas have been done in stationery’s long history. If anyone asked me why I keep trying new things and haven’t settled, I’d say it’s because new things keep coming out, there are new ideas to explore. 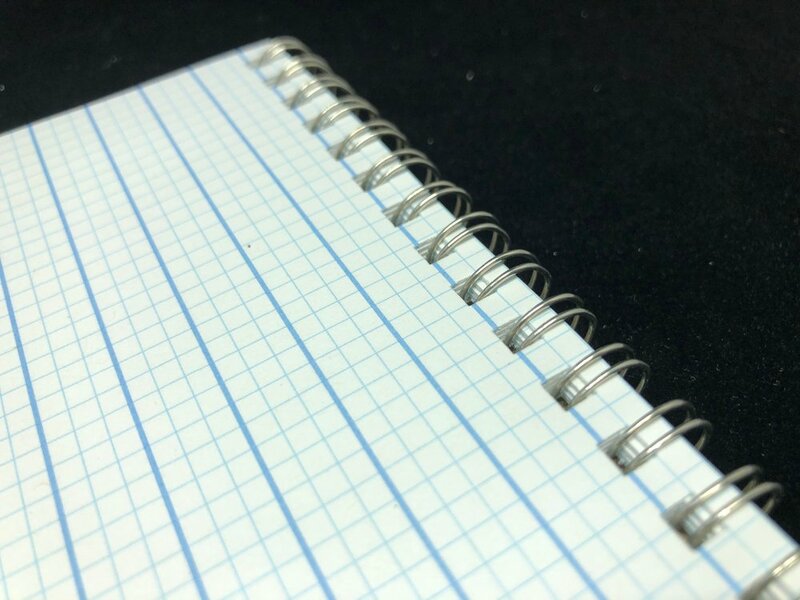 One little tweak can turn an good notebook into a great one. I get so close, but then my needs change. There’s never going to be a perfect notebook for everyone, but there may be one for you. If you can’t find it, make it. That’s what Doane did. The product I’m looking at today is called the Large Flap Jotter on their site, but I’m just gonna called it the Jotter. This is a steno-style, top bound notebook with double wire-o binding. It’s essentially a steno pad without being Gregg ruled. To be honest, it most reminds me of the Nock Co. spiral pad. It’s very similar in size (5.5” x 8.5”) and weight, even down to the fact that the covers are a little floppy. This one has been placed into the “next to the mouse” role on my desk, as I tend to use a top-bound book for that, usually in this size. I’ll generally use it for throwaway notes or short task lists, writing out the steps of a larger task I plucked from my bullet journal to do. The book is perfect for this use case, for me. That Brad Dowdy, the Pen Addict himself, loves this paper, is no surprise to me. The paper is a bit thinner and there is more show-through than I imagined, much like the Nock Co spiral pad. Rhodia this is not. It is not terrible paper, not in the slightest. 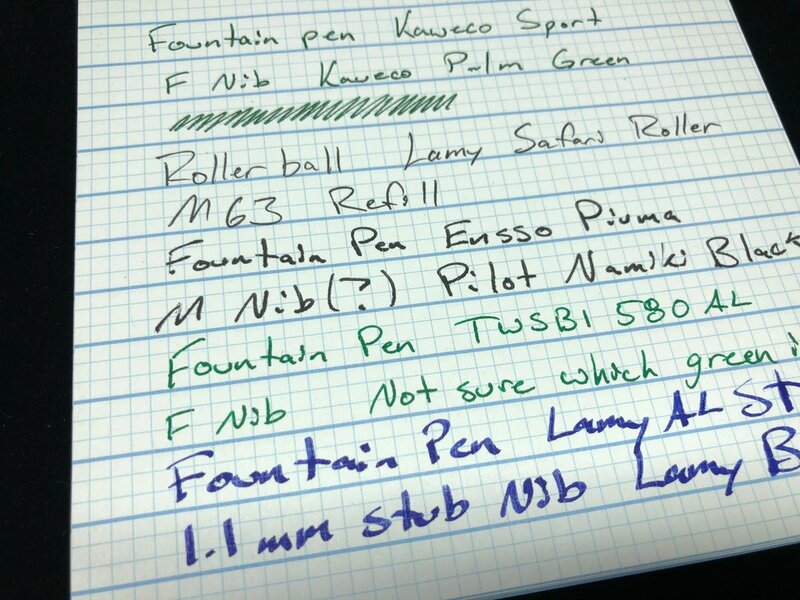 But because Brad was such a proponent that he chose to use it for a ton of review, I would have thought it was great with fountain pens. Your gusher pens aren't gonna fare well, but if it doesn't bleed through normally, this paper will do pretty well with it. For pencil, this is solid. The paper is smooth, but not too much, and it won't shear down a pencil point like some toothier papers out there. I find the cover a little weak. I wish that it had a heavier back. This style of notebook is meant to be held in hand and notes taken, and a lot of stenos have a heavier back cover card. It looks heavy to the eye, but don't let the pictures fool you. While it IS chipboard, it's thin. Hefty enough to protect the paper, but not really heavy enough to keep it straight. I can see why you may not want it that heavy, but to me, it's necessary for this style and size of steno pad. Now, I touched on it above, but it's time to talk about the layout in depth. There are heavy lines for every 3 grid boxes. The grid squares are 1/8 of an inch. Compare that to a Field Notes grid, which is 3/16. So .125 vs .1875. The grid is too small for my tastes. It's the same dimensions as a Write Notepads standard graph or the Field Notes Utility engineering graph. So 3 of the boxes is one line of the ruling...which is 3/8 inch, or ~9.5mm. That is a super thick line. My preference is somewhere around the 7mm mark. I don't write small, but I definitely don't write that big either. If the lines are gonna be wide ruled, I'd like to see only 2 boxes inside. But if the grid size is more important, I'd like to see the lines be every other box, instead of every third. Essentially, my ideal Grid + Lines setup would be 3/16 inch boxes with every second line a bold line. Regardless of my personal preference on the grid set up, the grid portion of the layout is light enough to straight up ignore, and I basically do. I use this as a lined book. 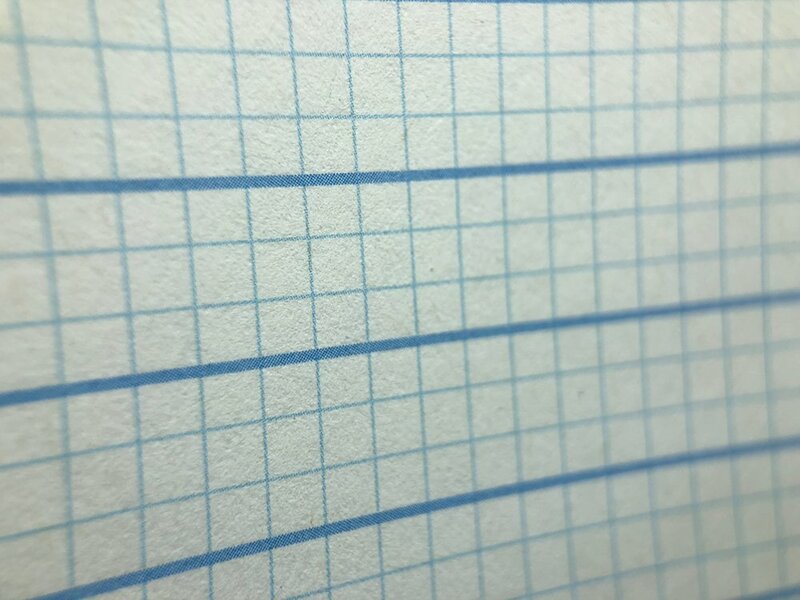 The blue of the grid is light enough to fade behind most inks, but depending on the lightness of your pencil, the color may interfere. Most HBs are gonna be just fine, but you fans of the H and harder are probably going to want to steer clear, as the busy layout may compete with your light lines. I like people to know I've been there; soft smudgy pencils, thick gel pens, and wet liquid ink pens are my go-to, so I have no problem. The layout, while busy, is nowhere near as busy as the Nock Co Dot-Dash ruling, which the more I use the more I realize it's not for me. Overall, this is a solid book. I've gotten the pocket notebooks as well, but have yet to use them. They have the same ruling, but I'm wondering if I'll be less picky once I'm using the Grid + Lines in a pocket-on-the-go setting as opposed to a desk setting. If you think you might want to try these, you should head over to Doane Paper and take a look at the offerings. Available from Doane Paper, $9.